 What is Yasukuni Shrine? The Yasukuni Shrine is dedicated to about 2.5 million people who have died in Japan's conflicts between 1853 and 1945. Their names are inscribed in the shrine's Book of Souls, and venerated as "gunshin", or war gods. In 1978, 1,068 convicted war criminals, among them executed wartime prime minister Hideki Tojo and 13 other Class A war criminals, were secretly enshrined there. The shrine's authorities are reluctant to accept the verdict of war crimes tribunals, and history. "War is a really tragic thing to happen, but it was necessary in order for us to protect the independence of Japan and to prosper together with Asian neighbors," explains a pamphlet published by the shrine, aimed at children. Referring to the convicted war criminals, the pamphlet says: "Some 1,068 people, who were wrongly accused as war criminals by the Allied court, were enshrined here." About eight million people a year visit Yasukuni, according to the shrine's website, many to pay respects to their ancestors' "mitama," or souls remaining on earth to watch over their descendants. The shrine, situated in central Tokyo just outside the moat to the Imperial Palace, was established in 1869 as the Tokyo Shokonsha, or Shrine for Inviting the Spirits, during the reign of Emperor Meiji. The shrine was intended to venerate those who died in the struggle to reassert imperial rule in place of shogun warlords. 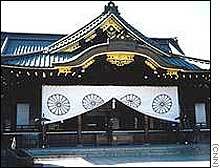 Ten years later it was renamed Yasukuni Shrine, which means Shrine for Establishing Peace in the Empire. More than two million people killed in the Pacific region during World War II are commemorated. "Owing to the meritorious services of the spirits of the deities worshipped, the nation enjoys peace and security," the shrine explains on its website. After the war ended, the US-led occupation forced the shrine to become a private religious foundation. It has remained so, despite the efforts of members of the conservative, ruling Liberal Democratic Party to restore state protection. Koizumi, who took office in April, is the third Japanese premier to visit the shrine since 1978. There was a 1985 trip by Yasuhiro Nakasone and a visit by Ryutaro Hashimoto on his birthday in July 1996.